Each year, between May and September, the New Jersey State Park Service hires approximately 600 people to fill peak-season jobs at New Jersey’s parks, forests, recreation areas and historic sites. No experience is necessary. Salaries start at $10.00 per hour. The minimum age for most positions is 16 years old. For further information on employment with the New Jersey Department of Environmental Protection, visit https://www.nj.gov/dep/jobs/. Spend the summer enjoying the warmth of the sun and the wonderful landscapes of New Jersey's state parks, forests and recreation areas, while you enhance your resume in this admirable public service. Learn valuable life skills such as responding to emergency situations and administering first aid, CPR, AEDs and oxygen. 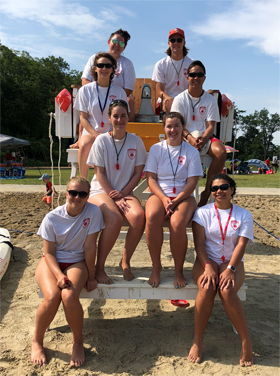 Applicants under 18 years of age must have an official State Park Service permission slip signed by a parent or legal guardian to participate in lifeguard testing. Step 1: Print and fill out our 2019 Seasonal Application - (PDF file) File Size: 879 KB. Step 2: Submit your completed application to your preferred park. Lifeguard employment opportunities are anticipated at the following areas, please contact your respecitive park for further information. Clear an area of trash, litter and debris, maintain grounds, buildings and/or piers and operate mowing equipment. Operation of power tools and equipment as permitted by the New Jersey Child Labor regulations NJAC 12:58. Trail Steward positions are available at Ringwood State Park, Wawayanda State Park, and Worthington State Forest. These positions require applicants to be at least 18 years of age and able to hike strenuous distances daily. Applicants should be assertive and professional for handling intense crowds and educating visitors on the Leave No Trace concept and park regulations. Trail stewards must be able to work 40 hours a week, on shifts from 10 a.m. to 6:30 p.m. or noon to 8:30 p.m. Provide accurate information to visitors at various facilities throughout an area, report emergencies and direct traffic. Perform visual inspections of area facilities and grounds. Conduct nature and/or historic tours. Assist in the preparation of public information materials, displays and programs. May demonstrate, perform and interpret craftwork under supervision. Greet visitors, make the public feel welcomed while providing information about the park, collect fees, issue permits and passes, operate office equipment, type, file and perform billing and payroll functions as needed.